Toyota Gazoo Racing raced to its first podium finish at the Nürburgring on Sunday, taking third place in a challenging fourth round of the 2017 FIA World Endurance Championship. The meeting started promisingly, with the #7 Toyota TS050 Hybrid of Mike Conway, Kamui Kobayashi and José María López claiming pole position at the German circuit, close to the team’s Cologne base. The #8 sister car of Anthony Davidson, Sebastien Buemi and Kazuki Nakajima came through qualifying fourth fastest. While Kobayashi led the early stages of the six-hour race, the #8 car ran into immediate problems on the formation lap and lost eight minutes and five laps in the pits for a fuel pump to be replaced. Meanwhile a fierce battle raged at the front of the race with Kobayashi successfully keeping the two Porsches at bay before handling the wheel to López at the first driver change. At the eighty-minute mark the Toyota had fallen to third place, but was still within two seconds of the race leader. 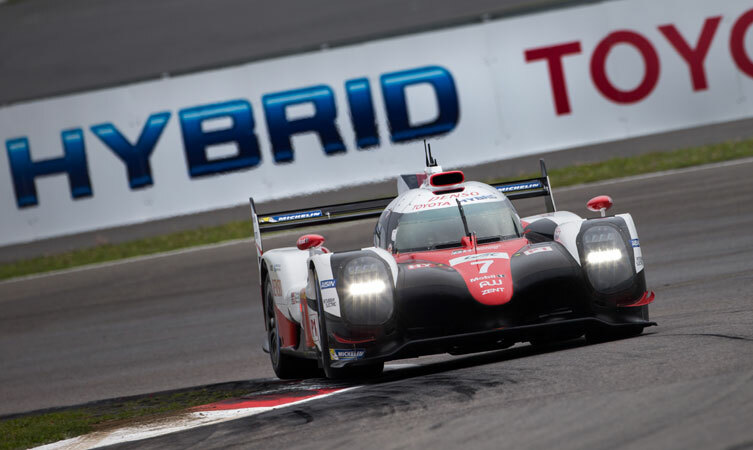 However, as the race progressed, both Toyotas experienced a negative change in their aerodynamic performance that effectively ended their chances of improving their track positions. Kobayashi took the chequered flag in third place in the #7 car, with Nakajima completing a dogged drive by the #8 crew to complete the race in fourth. The results keep Toyota in the fight for the manufacturers’ championship, 39.5 points behind leader Porsche. Conway, Kobayashi and López trail by 30 points in the drivers’ title race. The race marked the end of the European leg of the WEC season. The action will now move to North America for the fifth and sixth rounds of the championship, in Mexico City on 3 September and Austin, Texas, on 16 September.